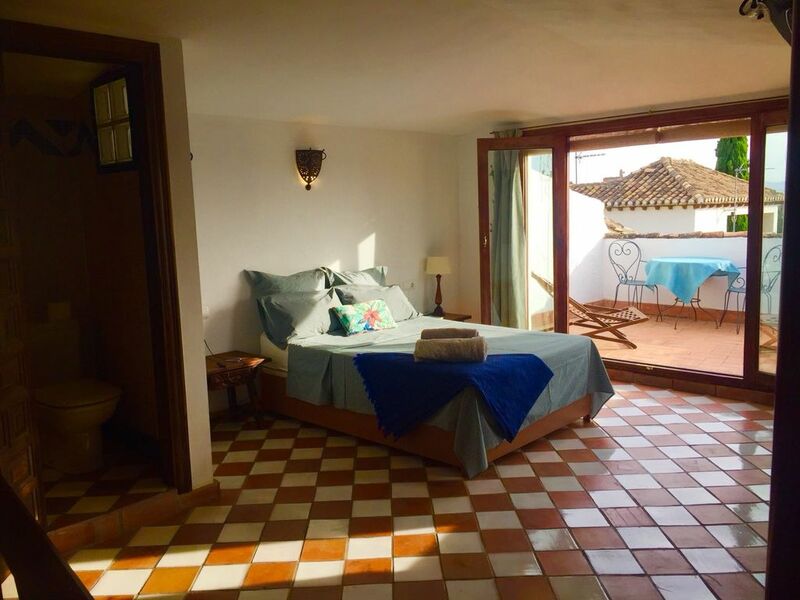 San Luis is a charming, comfortable 3 bed Albayzin house. Tastefully decorated and furnished in a traditional way cotton linen. Leading from the kitchen are two caves, the original house. Perfect for cool siestas in summer or place to share a bottle of local wine. From both terraces there are views, the top having spectacular Alhambra and Generalife views backdropped by the snowcapped Sierra Nevada. The lower terrace with views of San Salvador has a table and chairs. Located in a quiet street 2 mins walk away from the unique buzz of plazas Larga and Aliatar with restaurants, market and shops. The Albayzin is the oldest & most beautiful part of the city, here is one of the best places to enjoy Granada. From beautiful Carmen to ruin the short walk into the city center is a visual treat. 5 mins from the house is Sacremonte with its cave houses. You can walk to the Alhambra or catch the hopper bus, Located at San Salvador-2 mins away. Full gas central heating and hot water. We arrived for a year sabbatical and never looked back . We were looking for a warm hearted place to raise our children and have not been disappointed . For the wonderful views , Light , Sunsets and 2 private terraces! Ensuite shower room to bedroom 1 with shower, basin & toilet. Bathroom with Bath shower head, toilet, bidet & basin. Dining room with good sized round table & 6 chairs. Living room with sofa and 2 chairs, TV & DVD player. Electric oven,Gas hob, fridge/freezer, Washing machine, Dishwasher. 50 mins to the spectacular Sol & Nieve skiing resort in the Sierra Nevada, info in the house & can be provided via E-mail. Golf courses close by, info provided on request. Notes on accommodation: Fully central heated. Suitable for children. Outside: Entrance patio with space for skis etc, and 2 terraces. One with table and chairs the other with a bech and coffee table. Cleaning / Towels / Linen / Maid service: Towels & linen are included. Cleaning service is available on request. Other: Two caves, one with a double bed the other a cool seating area. The language & Flamenco School 'Carmen de las Cuevas' in the same street where you can take intensive Spanish courses or Flamenco in this marvelous setting. The Costa Tropical is 50 min drive away.Salobrena is the 1st resort With a long Beach, rocky point & cafes. The old town built on steep rock is of historical interest. Granada Airport 30 mins from house. British Airways Fly London city - Granada. Malaga Airport 1hour45mins away by car or hourly bus. Car hire is available at the airport. Also excellent bus service through ALSA from Malaga 12 € From Madrid 17€ ! Alhambra and centre of Granada 8 mins walk. San Nicolas for great views 3 min walk. Info above. There are two banks with cash points 2 mins away also a 9-9 supermarket.